Before I get to what I promised last time, I want to talk for a moment about scale. 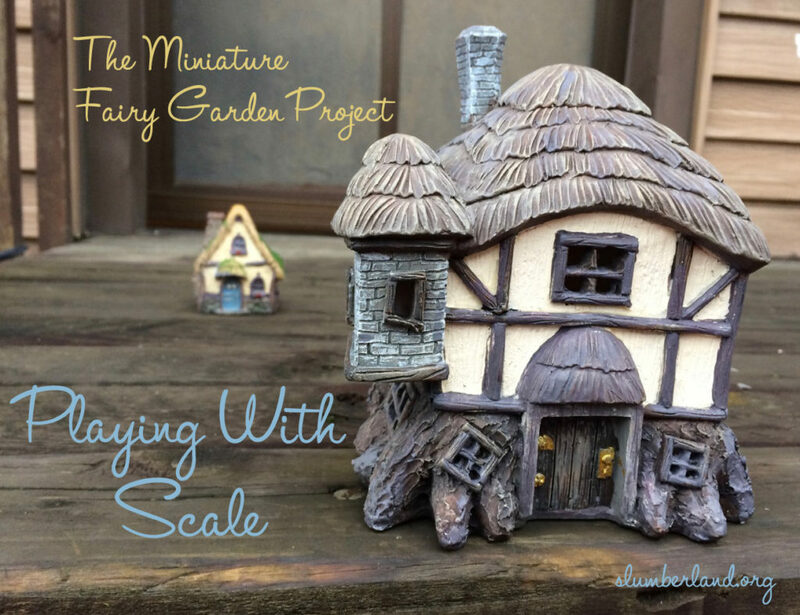 Like model railroads, fairy gardens come in many scales. The most common is 1:12 or 1″ scale, which means one inch in your miniatures is the equivalent of one foot in the real world. Other common scales include 1:24 or 1/2″ scale (1/2 inch is the equivalent of a foot) and 1:48 or 1/4″ scale, which means 1/4 inch is the equivalent of a foot. An example in the chart is the height of the door in your fairy house. If the door is 6″–7″ tall, it’s probably 1:12 scale. If it’s 3″–4″ tall, think 1:24. And if it is 1 1/4″–1 1/2″ tall, it’s likely 1:48. My garden is pretty small — the average scale is closer to 1:48. However… as it turns out, there are a lot of accessories out there that aren’t made to one of these scales. 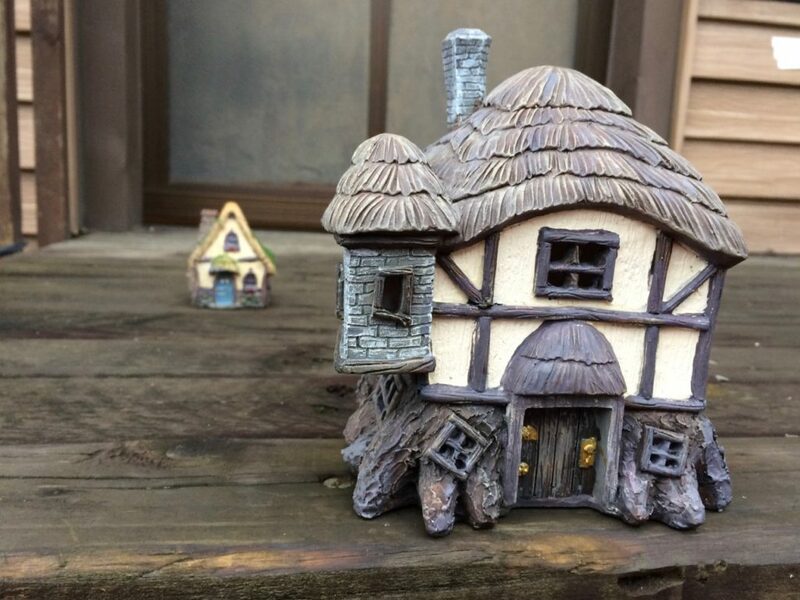 Sometimes you find the perfect miniature mansion or tiny teeter-totter or wee wishing well, and it just doesn’t match your planned scale. What do you do then? How tall do you think these houses are, relevant to each other? Is one bigger? Are they the same size? How far apart are they? What do you think? Try to guess before you scroll down further. 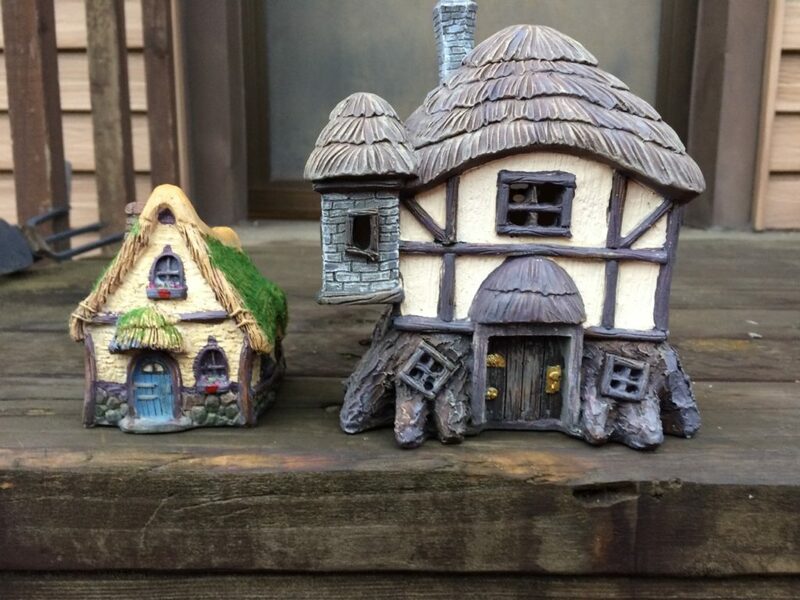 The house on the left is smaller than the one on the right. In the previous picture, however, the eye tends to see them as being roughly similar sizes. When you see a small house in the background, your brain thinks it’s small because it’s far away, not because it really is smaller. (This illusion would work far better if you could not see the wooden boards the houses are sitting on.) This is called forced perspective. Forced perspective is used in many places, but at Disney theme parks, you can see it used to change the apparent height of buildings such as the castle, and to change the apparent size of Snow White in Disneyland’s Snow White Wishing Well area. For the castle, the upper sections are made smaller than they should actually be, so when a guest sees them, the brain will be fooled into thinking the castle spires are much further away — taller. The situation for Snow White is similar. 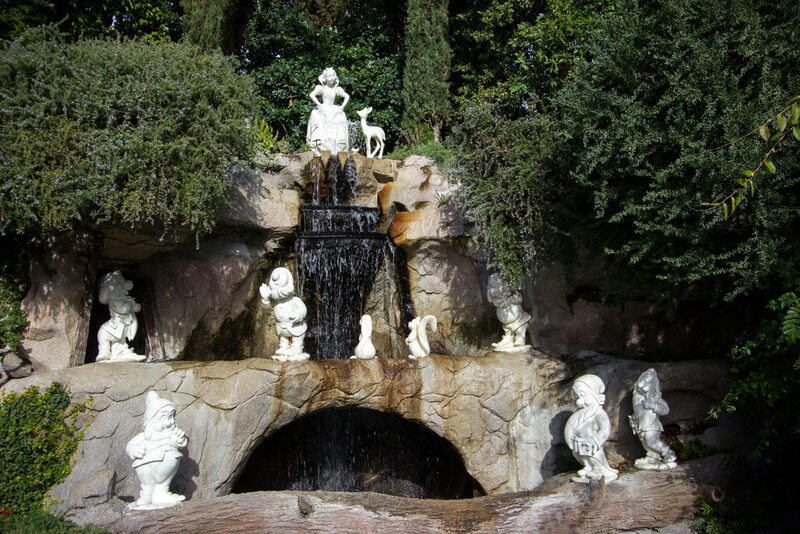 Disney received a set of statues as a gift once: Snow White and the Seven Dwarfs. But… they were all the same size. Snow White was the same height as the dwarfs. And as we all know, she was quite a bit taller in the movie than the dwarfs were. So Disney solved this problem with forced perspective. The Snow White statue is set much further up on the hill than the dwarf statues. The brain is fooled into thinking she only looks too small because of the distance. It’s fascinating; even knowing that Snow White is the same height as the other statues, it’s hard to make yourself see it. 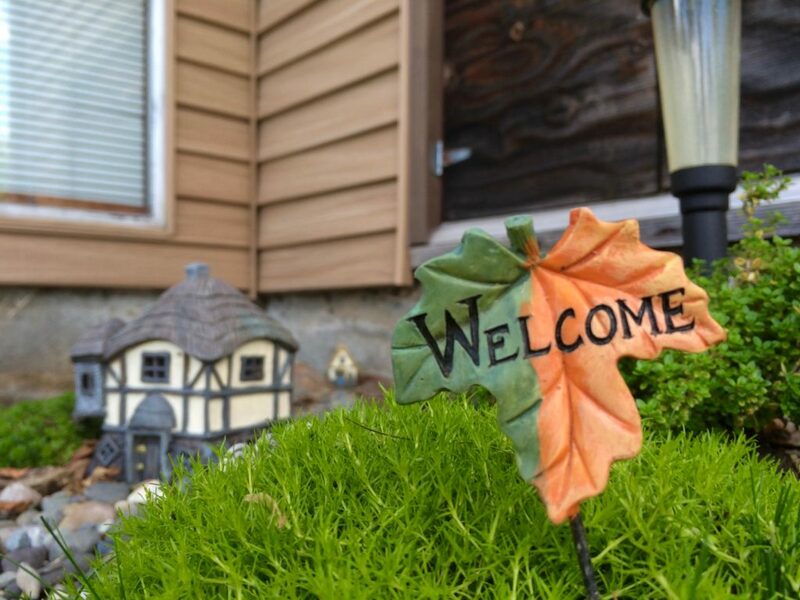 How does this apply to your miniature garden? Two ways. One is that you can make your garden look larger by using forced perspective. Putting small items further away from the viewer will fool the eye into thinking that the space is bigger than it is. And the other way is that you can use it to “mix scales” in your garden. If you have a large house and a very tiny house, use forced perspective so that both of them can fit in the garden without the size looking wrong. A view from the front of the garden to the back. Then, way in the back, we see one of the smaller peak-roofed houses. We already know from the photos above that that house is smaller than the one in the middle distance. But in this photo? The brain has no trouble seeing it as larger, and believing it’s just far away. If I switched those two houses, it would look very odd indeed. We’d see a small house in front, and what would appear to be a giant behemoth of a house behind it. If I moved the Welcome sign next to the small house, it would suddenly appear bigger than a billboard! So that’s forced perspective. You don’t have to use it, and sometimes you really don’t need to, but it can be a lot of fun to play with — plus, it allows you to acquire lots of accessories in different sizes that otherwise wouldn’t work together. Next post, I’ll get back to what this one was planned to be — some more things to consider when planning your garden, and the “magic tips” to make your garden come to life. 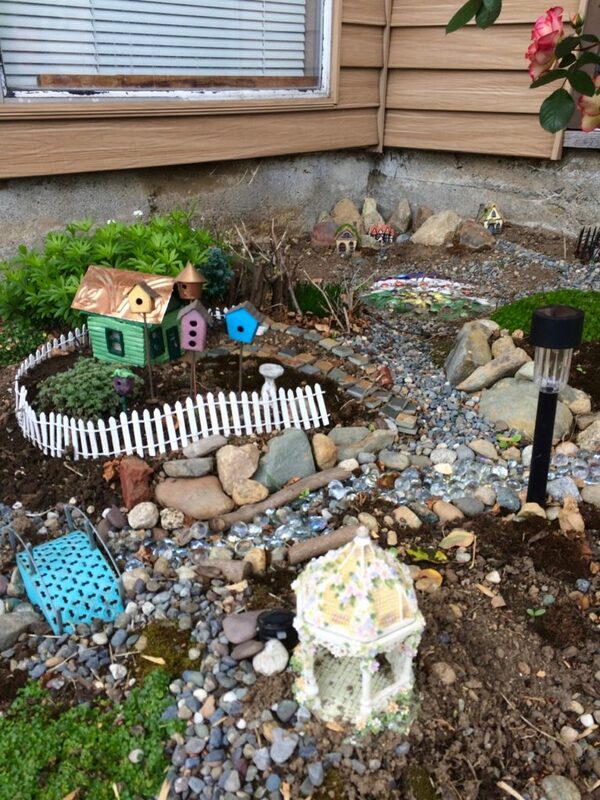 Don’t forget that if you are in the Seattle area, I teach a workshop on creating your own unique fairy garden. You can find out more and sign up at Verlocal. See the previous post in this series here.